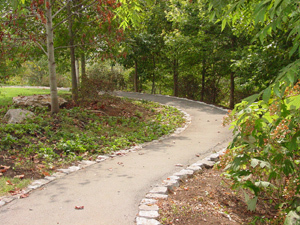 Pedestrian facilities in the Johnson City Urbanized Area include sidewalks, greenways, and trails. Sidewalks are common within the Cities of Johnson City, Elizabethton, and Jonesborough, but are fairly sparse in the unincorporated portions of the study area. The Cities of Johnson City, Jonesborough, and Elizabethton are developing dedicated bicycle and multipurpose paths as part of corridor and greenway projects. In Johnson City, a 3-mile path parallels the North State of Franklin Road corridor (SR 381) between West Market Street and Greenline Road. Scenic views are abundant along this route. In Elizabethton is the Linear Path, a 4-mile greenway corridor is under development that connects Sycamore Shoals State Park with the Historic Covered Bridge in the downtown area. The Town of Jonesborough has completed Phase 4 of the Lost State Scenic Walkway that connects Persimmon Ridge Park to the downtown. Persimmon Ridge Park has 3 miles of hiking trails through a natural wetlands area. Funding for major portions of these projects is from the STP Enhancements Program operated by the TDOT. The latest project to be completed is the Tweetsie Trail, an 10-mile trek starting at Alabama Street in Johnson City and continuing to Hatcher Lane in Elizabethton. It was completed by the City of Johnson City Public Works Department and funded by donations from the community. The City of Johnson City, as part of the Johnson City Comprehensive Plan, has a Transportation Element for implementing a Bikeway-Greenway Plan. To view this plan, go to the Johnson City Bicycle and Pedestrian Plan.